Canada’s National Post has published a story that raised blood pressures in my household this morning. A six-year-old, kindergarten boy begs his mom not to wrap his sandwich – the one he’ll be eating for lunch at school – in a ziploc bag. As the news article goes on to make clear, there is a debate amongst people who might be considered environmental experts about whether the soap and water that is consumed by reusable lunch containers is really more environmentally friendly than throw-away plastic bags. Intelligent, reasonable people happen to disagree on this question. Which means that school teachers should be told point-blank by their superiors that they themselves are not entitled to be the supreme arbiters. This is a case of teachers attempting to impose their personal lifestyle choices on vulnerable and powerless six-year-olds in their care. For shame. We send our children to school to learn to read, write, and do math. Nagging them about the environment was never part of the bargain. Environmental issues are political issues. Which environmental concerns are really the most serious? What is actually the wisest response? What trade-offs are reasonable? These are political matters that must be debated and resolved by the larger, adult community. 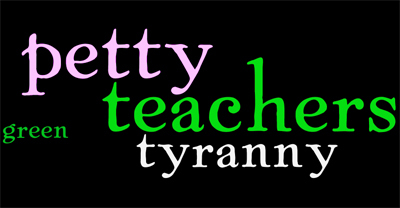 Teachers should not be behaving as if there’s only one, self-evident course-of-action. By the way, just when did teachers decide it was any of their frakking business how parents package kids’ lunches? When employees of the state start to intrude into my life in such an intimate manner, that’s when I draw a line in the sand. As a free person in a free society, I have a right to choose how to package my child’s lunch. And I have a right to expect that my child is going to be treated with respect regardless of my choices. Many Canadians have fond memories of a former Prime Minister who famously said, back in 1967, that the state has no business in the bedrooms of the nation. Well, the state has no business in my kitchen, either. This is not an acceptable way to save the planet. This entry was posted on February 1, 2011 by Donna Laframboise in children, ethical & philosophical, free speech and tagged free speech, intellectual freedom.